KATHMANDU: The World Bank has pointed out five major risks to the economic outlook of Nepal including reform implementation constraints and vulnerability to natural disasters. Releasing a new report for its regional economic update on Sunday, the World Bank said that the economic growth of Nepal is projected to grow by 6 percent in the current fiscal year 2018/19. While saying that the growth is likely to be strong in the mid-term, the periodic report has also highlighted five key risks for the outlook. These risks include slow implementation of reforms to increase private investment, especially foreign investment, limited resources and capacity to support federalism and local service delivery, and constraints on credit as banks limit lending to meet the CCD (credit to core capital plus deposit) ratio regulatory limit, according to the report. Similarly, other risks to the growth identified in the report are adverse effects of natural disasters and shocks to remittance inflow. “The poverty outlook is especially sensitive to remittance inflows, natural disasters and local level implementation capacity constraints that may hamper service delivery,” read the report. Against the backdrop of implementation of federalism, the report has also found the capacity to sustain service delivery and establish fiscal discipline, particularly at the local levels, a major challenge to the growth prospect. “The transfer of financial management staff over a year ago made it possible for local governments to prepare budgets and receive fiscal transfers of 8 percent of GDP in FY2018/19. However, under-spending of the budget persists,” the report stated. The report’s growth forecast of 6 percent in the current fiscal year is, however, lower than the recent Asian Development Bank’s projection of 6.5 percent, International Monetary Fund’s 6.5 percent and the government’s own target of 8 percent. “In Nepal, GDP growth is projected to average 6 percent over the medium term. The services sector is forecast to benefit from strong tourism, and manufacturing will be supported by the opening of Nepal’s largest cement factory next year,” read the report, adding that it anticipates the ‘strong’ growth to continue to drive significant poverty reduction. 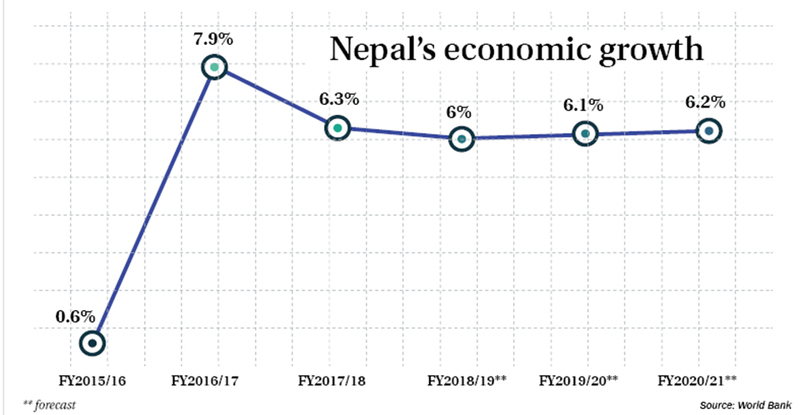 Nepal is bracing for over 6 percent growth for the third consecutive year. In FY2017/18, the growth is estimated to reach 6.3 percent, compared to 7.9 percent in the previous fiscal year. Meanwhile, the report, which has focused this time on how South Asia can boost its exports to maintain growth, also calls for increasing the region’s exports to sustain its high growth and reach its full economic potential.